This article is about the adoptive son of Hadrian. For the Praetorian prefect called Lucius Aelius Sejanus, see Sejanus. Lucius Aelius Caesar (January 13, 101 – January 1, 138) was the father of Emperor Lucius Verus. In 136, he was adopted by Hadrian and named heir to the throne. He died before Hadrian and thus never became emperor. After Lucius' death, he was replaced by Antoninus Pius, who succeeded Hadrian the same year. Aelius was born with the name Lucius Ceionius Commodus, and became Lucius Aelius Caesar upon his adoption as Hadrian's heir. He is often sometimes referred to as Lucius Aelius Verus, though this name is not attested outside the Augustan History and probably the result of a manuscript error. The young Lucius Ceionius Commodus was of the gens Ceionia. His father, also named Lucius Ceionius Commodus (the author of the Augustan History adds the cognomen Verus), was consul in 106, and his paternal grandfather, also of the same name, was consul in 78. His paternal ancestors were from Etruria, and were of consular rank. His mother was a surmised but otherwise undocumented Roman woman named Ignota Plautia. The Augustan History states that his maternal grandfather and his maternal ancestors were of consular rank. Lucius Ceionius Commodus the Younger – He would become Lucius Verus, and would co-rule as Roman Emperor with Marcus Aurelius from 161 until his own death in 169. Verus would marry Lucilla, the second daughter of Marcus Aurelius and Faustina the Younger. Gaius Avidius Ceionius Commodus – he is known from an inscription found in Rome. Ceionia Fabia – at the time of Marcus Aurelius's adoption, she was betrothed, as part of the adoption conditions, to him. Shortly after Antoninus Pius' ascension, Pius came to Aurelius and asked him to end his engagement to Fabia, instead marrying Antoninus Pius’ daughter Faustina the Younger; Faustina had originally been planned by Hadrian to wed Lucius Verus. 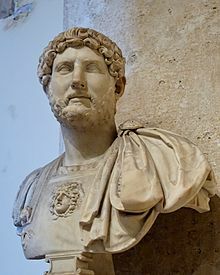 For a long time, the emperor Hadrian had considered his brother-in-law Lucius Julius Ursus Servianus as his unofficial successor. As Hadrian's reign drew to a close, however, he changed his mind. Although the emperor certainly thought Servianus capable of ruling as an emperor after Hadrian's own death, Servianus, by now in his nineties, was clearly too old for the position. Hadrian's attentions turned to Servianus' grandson, Gnaeus Pedanius Fuscus Salinator II. Hadrian promoted the young Salinator, his great-nephew, gave him special status in his court, and groomed him as his heir. After a year's stationing on the Danube frontier, Aelius returned to Rome to make an address to the senate on the first day of 138. The night before the speech, however, he grew ill, and died of a haemorrhage late the next day. [notes 1] On 24 January 138, Hadrian selected Aurelius Antoninus (September 19, 86 – March 7, 161) as his new successor. After a few days' consideration, Antoninus accepted. He was adopted on 25 February. As part of Hadrian's terms, Antoninus adopted both Lucius Aelius's son (properly called Lucius Ceionius Commodus the Younger) and Hadrian's great-nephew by marriage, Marcus Aurelius (April 26, 121 – March 17, 180). Marcus became M. Aelius Aurelius Verus; Lucius became L. Aelius Aurelius Commodus. [notes 2] At Hadrian's request, Antoninus' daughter Faustina was betrothed to Lucius. ^ Commodus was a known consumptive at the time of his adoption, so Hadrian may have intended the eventual post-Antoninus succession, anyway. ^ The younger Lucius Commodus did not take the cognomen Verus until his joint accession with Marcus after the death of Pius. ^ Birley, Marcus Aurelius, 41–42. ^ HA Hadrian 23.10, qtd. in Birley, Marcus Aurelius, 42. ^ Birley, Marcus Aurelius, 42. On the succession to Hadrian, see also: T.D. Barnes, "Hadrian and Lucius Verus", Journal of Roman Studies 57:1–2 (1967): 65–79; J. VanderLeest, "Hadrian, Lucius Verus, and the Arco di Portogallo", Phoenix 49:4 (1995): 319–30. ^ Anthony Birley, Hadrian the Restless Emperor, pp. 291–292. ^ HA Hadrian 23.15–16; Birley, Marcus Aurelius, 45; "Hadrian to the Antonines", 148. ^ Dio 69.17.1; HA Aelius 3.7, 4.6, 6.1–7; Birley, "Hadrian to the Antonines", 147. ^ Dio 69.21.1; HA Hadrian 24.1; HA Aelius 6.9; HA Antoninus Pius 4.6–7; Birley, Marcus Aurelius, 48–49. ^ a b Birley, Marcus Aurelius, 229–30. The thesis of single authorship was first proposed in H. Dessau's "Über Zeit und Persönlichkeit der Scriptoes Historiae Augustae" (in German), Hermes 24 (1889), 337ff. ^ Birley, Marcus Aurelius, 230. On the HA Verus, see Barnes, 65–74. ^ Birley, Marcus Aurelius, 227–28. Wikimedia Commons has media related to Lucius Aelius.